That single tweet, favorited and retweeted (shared) several thousand times throughout the night and following days, broke the record for being the most tweeted status in Twitter’s history–it has garnered over 3 million retweets. Notice also the pound sign and keyword combination: “#oscars.” That lowly ‘#’ symbol is a big reason Twitter has been able to connect people in powerful new ways, and it is one aspect of Twitter I want to address. The ‘#’ symbol followed by a keyword is known as a “hashtag” or simply “tag” in social media circles (I will use it interchangeably in this document), and it is “used to mark keywords or topics in a Tweet. It was created organically by Twitter users as a way to categorize messages (Twitter, 2014).” Twitter users created it, and hashtags have proved useful to content producers as well. These range from social media people and events, to cleaning products, to government agencies as a way to have their content recognized in media and social networks. By adding a tag to a show, concept, or presentation, they let viewers and participants know that by searching for a particular tag on Twitter they can find additional tweets or information about that event, and to share it accordingly to others in their own social networks. Twitter makes sharing that content easily by means of retweeting (or re-posting) said content. For information professionals, Twitter is great tool for discovering and sharing conference proceedings, social events, or simple gatherings. These can be from local, city, county, state, regional and international entities; to nonprofit, for-profit, commercial, educational, and government circles. As Twitter continues to grow (remember that 645,750,000+ figure?) it becomes apparent that your Twitter followers, big or small, will gain some nugget of knowledge as you tweet your experiences throughout the day, especially if those tweets contain research-related material. This is particularly true if your Personal Learning Network (PLN) is a rich and well populated one. A PLN, according to Lalonde (2012), is “an informal learning network of people you connect with for the specific purpose of learning, based on reciprocity and a level of trust that each party is actively seeking value added information for the other.” Twitter enhances this particular type of network nicely. I recently attended a free webinar on how to find reliable international statistics, and provided numerous website links. This was relevant stuff for anyone in education and information fields, something to be shared widely and enthusiastically. However, because this particular presentation did not include a hashtag (and, as it is often the case, at least for me, to multitask and share research-friendly tweets whenever I am able to), I felt the resources and ideas from this presentation were not fully shared to a potentially appreciative audience–mainly those research-happy Twitter users. This was a missed opportunity. First, it ignores Twitter folks as viable message enhancers–before, during, and after the event has taken place. Without a hashtag to unite under, users are likely to create their own to separate the witnessed event from their general Twitter status posts. Second, if several people attend the same event (some via online, some on-site) their potentially useful tweets will go unnoticed by others as there is no anchoring tag to keep the tagged conversation going; or many tags are borne out of the same conversation, thereby diluting the overall message. Third, it ignores the backchannel such events generate: hashtags provide the easiest way to help promote, keep track, and disseminate the presentation’s key concepts throughout and after the presentation; it helps unify the overall narrative and provides a channel that empowers conversation to take place–the impressions, links shared, and commentary that provide added insight even to those who come in late to the conversation, or where not able to attend altogether. As an active Twitter user and information professional who enjoys sharing research tidbits, I strongly suggest adding a hashtag to your presentation (on every slide if possible), event, or social gathering. This digital stream of consciousness shared via tags is a powerful connector because it ties differing user experiences, on a variety of social media outlets, to a specific narrative or concept. And one you can revisit any time. A presenter who does not add a hashtag to their presentation–and it seems a simple enough task–misses an opportunity to have their shared to a wider audience. Let your Twitter PLN in on the action! Use initials or keywords that best describe your topic, or that tie-in to a conference or event. Do not make them too simple or you will likely copy someone else’s tag. Check Hashtags.org to see see if yours is available, or to make your own. On a tweet, hashtags are hotlinked. Click on a hashtag to see all the tweets that contain your particular tag. Do not use spaces, commas, or diacritical marks as they break the hashtag’s continuity and link. You can combine letters and numbers but avoid special characters. Make the hashtag as short as possible as the character length will count against the 140 character limit. 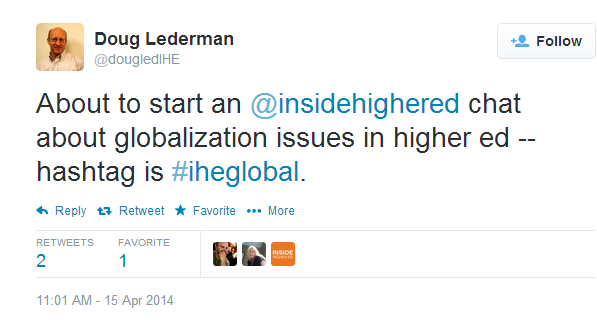 You can add as many hashtags as possible, but it is considered gauche to add more than two. Hashtags are not case sensitive so capitalize words to make them easier to read: #digitalarchives to #DigitalArchives. Hashtags can be placed anywhere on a tweet. Make your own hashtag if a presenter does not provide one. It will at least help keep your own tweets threaded. Boise State. [boisestatelive]. (2013, Aug 6). Soon, our beautiful campus will be filled with the best! Use the #boisestate hashtag when you share… http://instagram.com/p/dFlzObmKyB/ [Twitter post]. Retrieved from https://twitter.com/boisestatelive/status/368468787408150528. Druyan, A., & Soter, S. (writers), & Pope, B. (Director). (2014, Apr 6). Hiding in the Light [Cosmos: A Spacetime Odyssey]. FOX & National Geographic. Los Angeles, California: Fuzzy Door Productions. DeGeneres, E. [The Ellen Show]. (2014, Mar 2). 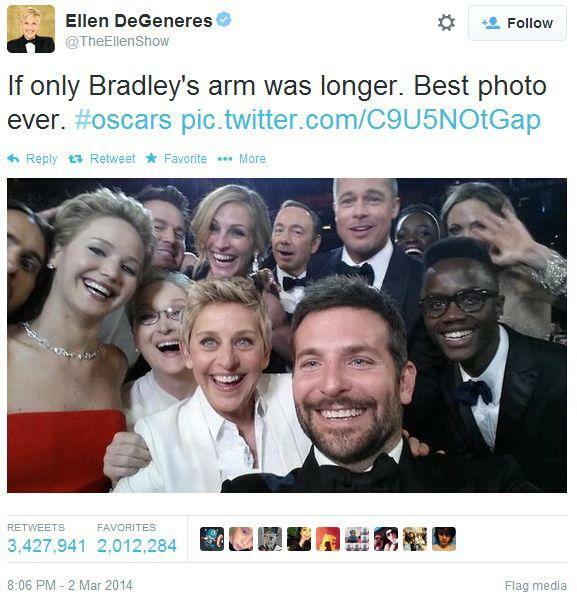 If only Bradley’s arm was longer. Best photo ever. #oscars pic.twitter.com/C9U5NOtGap [Twitter post]. Retrieved from: https://twitter.com/TheEllenShow/statuses/440322224407314432. Hashtags.org. (2012). Retrieved from http://www.hashtags.org/. Junkins, S. [sjunkins]. (2014, Apr 14). 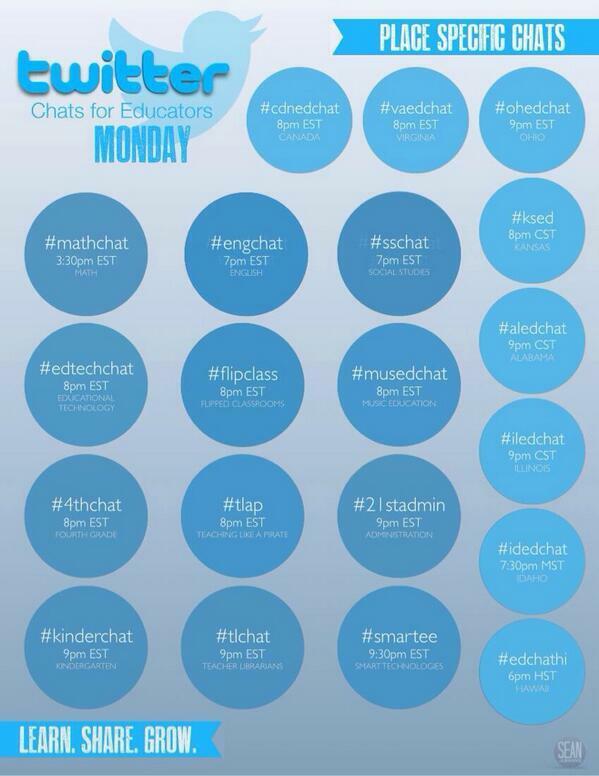 Make today “Invite a Friend to a Twitter Chat Day”. http://t.co/5HMDokehGx [Twitter post]. Retrieved from https://twitter.com/sjunkins/status/455805099542315009. LaLonde, C. (2012, September). How important is Twitter in your personal learning network?. Tagboard.com. (n.d.). Retrieved from https://tagboard.com/. The Walking Dead AMC [‏WalkingDead_AMC]. (2014, March 29). 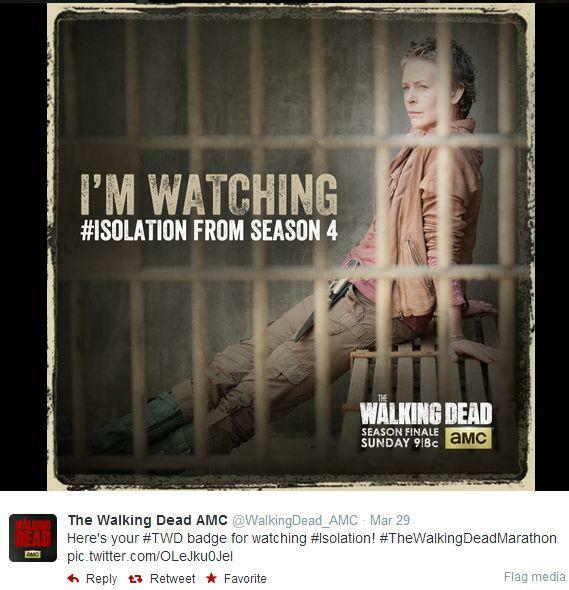 Here’s your #TWD badge for watching #Isolation! #TheWalkingDeadMarathon pic.twitter.com/OLeJku0Jel [Twitter post]. Retrieved from https://twitter.com/WalkingDead_AMC/status/450091319181213697. Makerspaces bring people together to collaborate, create, design, and share resources and knowledge. With increasing frequency these makerspaces are being started in libraries. By providing materials, instruction in the use of new technology, and an environment that supports the creative process, libraries are powerful equalizers that level the playing field for their users who may not otherwise have access to these hubs of community engagement. 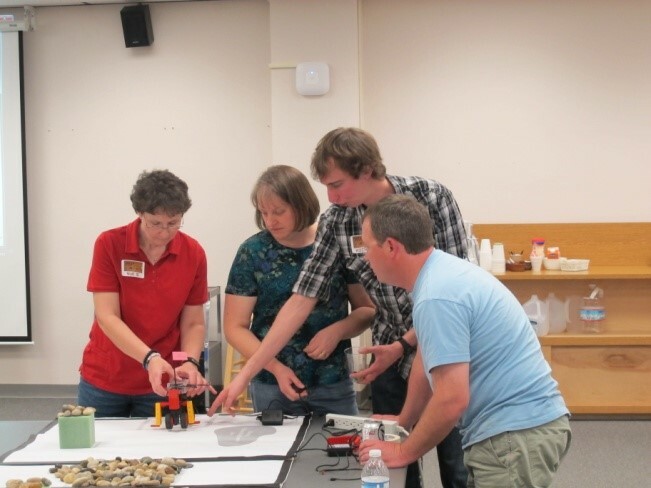 Makerspaces were launched in five public libraries across Idaho through “Make It at the Library,” a pilot project implemented in 2012‒2013 by the Idaho Commission for Libraries (ICfL). These pilot libraries represent diverse geographic regions as well as rural and urban communities: Ada Community Library, Community Library Network, Gooding Public Library, Meridian Library District, and Snake River School/Community Library. The project initially focuses on engaging teens through maker activities to draw them into these innovative spaces. The makerspaces will eventually be available to the entire community as the project evolves. The “Make It at the Library” project provides the necessary materials and training for pilot library staff to implement creative, STEAM-based (science, technology, engineering, arts, mathematics) programming for tweens and teens. The project also includes training on leveraging partnerships, involving community, and evaluating outcomes. ICfL project coordinators Erica Compton and Sue Walker looked at desired outcomes, available funding, ideas for tools, and various proven methods for achieving their goals. They built in face-to-face trainings and virtual check-ins to keep communication flowing; established timelines for programming requirements; and researched fun, open-ended materials and tools that could provide sufficient guidance for library staff and exploration opportunities for kids. They also developed evaluation methods and outlined staff requirements. ICfL provided the pilot libraries with STEAM manipulative kits and materials; customized curriculum; intensive training focused on makerspaces, programming, and design process; technical support; and evaluation tools. ICfL staff also created a webpage that outlines project details and a Facebook page to document progress, share lessons learned, and highlight successes. Additionally, ICfL staff members and participating staff from the pilot libraries have presented locally, nationally, and internationally to share what the Commission and libraries are learning. Attend six days of face-to-face trainings and three to five virtual trainings and check-ins. Dedicate the staff and space necessary to create a temporary or permanent makerspace. Use evaluation tools and anecdotal information to gather data on the number of teens participating in project events, interest in and efficacy of STEAM programming in the library, increase in knowledge of program topic areas, and best practices for improving and/or expanding programming for teens in the makerspace. Create, implement, and submit eight teen projects/events using the STEAM materials/curriculum and at least six “stealth” (informal) programs to be implemented in the makerspace. Complete all memorandum of understanding (MOU) requirements. The three libraries with branches have additional requirements to demonstrate how to scale the project up within a library system, and were required to send multiple staff members to each face-to-face training session. Pilot libraries were selected in December2012. Three webinars and three face-to-face trainings were scheduled from January through November 2013. Other webinars will be held to provide additional training as needed. ICfL wanted to provide a variety of STEAM materials and tools so libraries could explore many different programming ideas. Tools were selected that support project objectives, align with Common Core Standards, allow for complex projects, introduce motorized designs, include curriculum and project ideas, and include trainers or local support when possible. 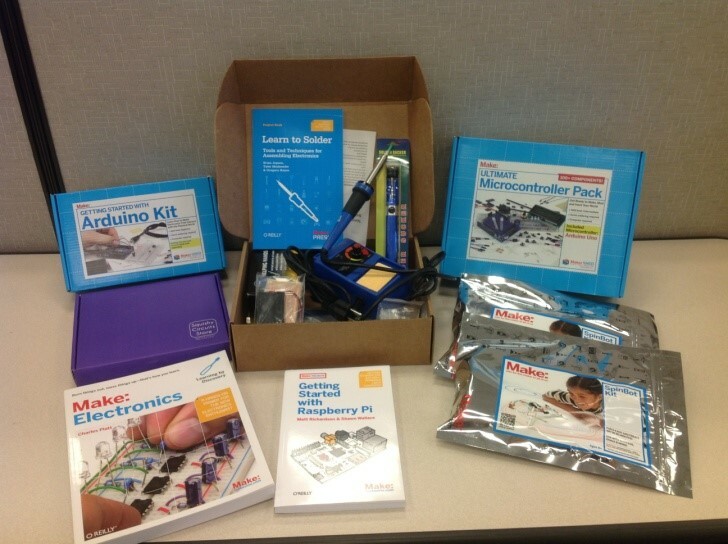 Choices include materials from PCS Edventures!, Reuseum, Maker Media/MakerShed, and RepRap MendleMax 3D Printers. It was essential to enlist an experienced trainer to work with the team, and PCS Edventures provided Kellie Dean to lead the workshops. Dean is an expert on experiential learning and helped build the foundation needed to implement the pilot. The trainings included discussions on the design process, inventory management, partnerships, evaluation, and formal and stealth programming. Staff members were encouraged to work as teams, making their colleagues an invaluable support system as they moved forward. Plenty of time was provided to work with the tools and brainstorm ideas on how to best use them in library settings. Significant time was spent with the curriculum, learning technical nomenclature, building principles, and how to extend projects in new directions. Staff members were also given an opportunity to talk about their library’s unique needs and brainstorm ways to engage the teens in their community. Frequent check-ins helped make sure that everyone was comfortable with the content and only then moved forward with more challenging projects. At a November 2013 workshop, staff will be trained on 3D design and on using 3D printers. Maker Media out of San Francisco will train on e-textiles and circuitry. 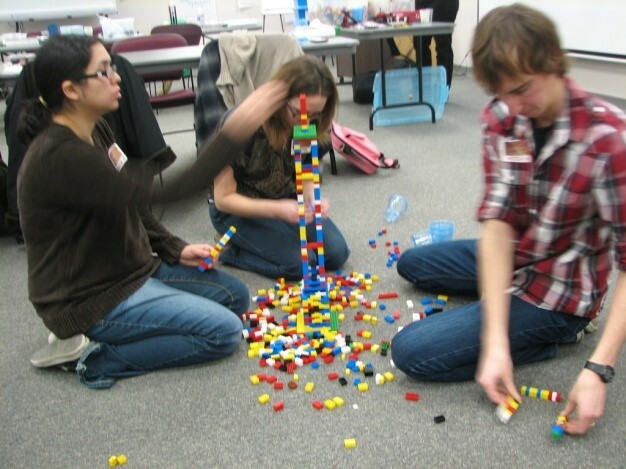 Library users: To evaluate the effectiveness of the makerspace activities and programs, they developed a survey tool to poll actual participants—as a group— before and after an activity. It is designed to record changes in skills, attitude, and behavior. So far there has been mixed success, but the survey is being modified as it is used and tested for effectiveness. Libraries: To evaluate the overall project from the libraries standpoint, ICfL is looking at attitudinal changes; circulation; attendance; space usage; and feedback from partners, community members, and library staff. Boise Mini Maker Faire, which included TED-style talks at Boise Public Library on day one with Compton and Walker, and hands-on workshops and demos in a science fair format at the Discovery Center of Idaho on day two with Compton, Walker, Nick Grove and Megan Egbert of the Meridian Library District, and Travis Porter of Ada Community Library. American Library Association Annual Conference, which included an overview, a brief hands-on opportunity with the tools, a presentation from Compton, an Animoto Videofrom Kate Radford of the Meridian Library District, and a Powtoons presentation from Egbert, who also related the presentation, as told through Twitter, at http://storify.com/MeganEgbert/make-it-idaho-ala2013. Pacific Northwest Library Association conference, which included a presentation by Grove, Porter, and Jennifer Redford of Boise Public Library on how libraries are implementing makerspaces to engage community participation and creativity. Afterschool Alliance webinar, where Compton noted the important role that libraries play in afterschool education and described how libraries are using the makerspace activities and related stealth programming to engage kids in STEAM learning. Association for Small & Rural Libraries (ASRL) Annual Conference, where Porter and Timothy Owens, Senior Program Officer in State Library Programs at the Institute of Museum and Library Services, shared ways to reach teens by adapting ideas from the maker movement. Idaho Library Association Annual Conference where Compton and Walker discussed using makerspaces to engage teens with STEAM. The importance of critical thinking, leveraging failure, and persistence in the design process were also highlighted. Innovation in U.S. 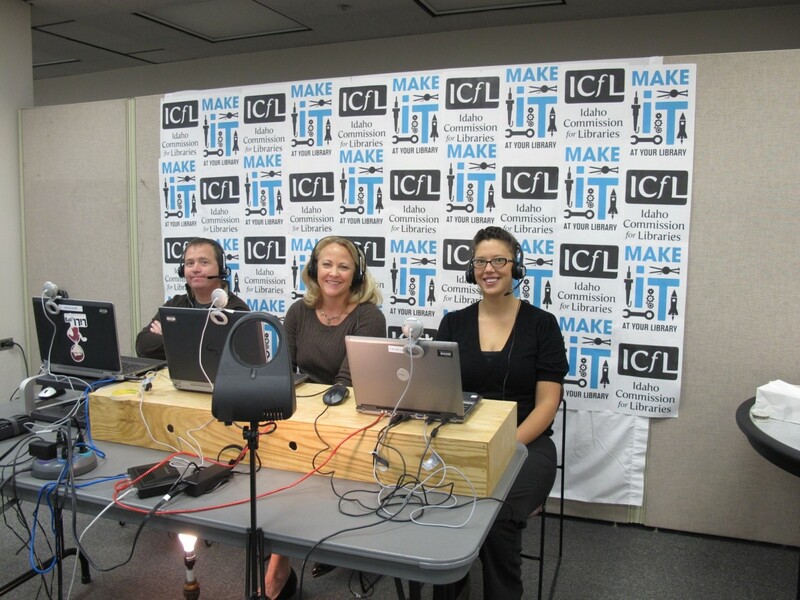 Libraries video conference broadcast into the U.S. Embassy in Paris, where Compton, Porter, and Egbert (using video teleconferencing equipment at ICfL) were joined by the Detroit Public Library Hypespace, Cuyahoga County Public Library, and the University of Pennsylvania. They described for high level French officials how Idaho libraries are fostering the acquisition of STEM and 21st Century skills with makerspaces. The libraries are doing an exceptional job implementing programs at their libraries. Below are some examples of how the pilot libraries have integrated the maker culture into their libraries and embraced making in all forms. Some libraries implemented weekly open making time. Others have a variety of programs offered throughout the week—each with a specific topic or focus. Not all programming is at a specific time and place. Stealth challenges prove to be a good way to expand the makerspace idea and allow participants to be creative on their own time schedule. Daily or weekly challenges are set out and require little or no staff time to implement. Some libraries tethered digital cameras near the challenge so kids could snap a picture of the finished project and enter it into a weekly contest. One library is looking at creating an outdoor makerspace where gardening, nature, and other related activities can be implemented. One library has set aside time for a Maker Day for staff. All staff will have time to work with the tools to ensure that they are well-informed and actively promoting the project to the community. One library incorporated the PCS Brick Lab® and Idaho’s sesquicentennial, providing new challenges that incorporate different parts of the Capitol Building or other parts of Idaho history. Branch libraries jumped on board and tried out programming right away. Kits were thrown in cars and taken on the road. 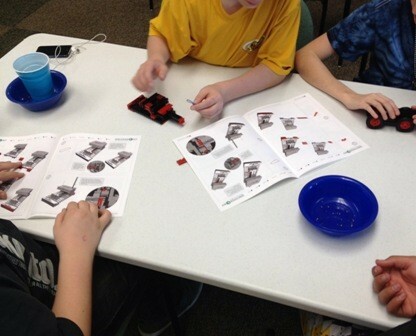 One library’s bookmobile took their PCS BrickLab® out and had a mobile makerspace! Training: Extensive training is vital. You need an experienced trainer, time to practice, reflect, and then come back for more. Scaffolding the learning (designing it to build on prior knowledge) is imperative. Communication: Ongoing communication is essential. Having frequent virtual check-ins, emailing reminders to staff about requirements, and keeping in touch through Facebook has enhanced the experience and helped ensure its success. Inventory: Many of the resources provided had thousands of tiny parts. Inventory management is something each library needs to think through to discover what works in their situation. Space: Actually creating a permanent space for making is easier said than done. “Not all of the libraries have dedicated spaces yet,” says Compton. “We started out thinking that every library would. However, we quickly found that this was going to be a major challenge. So we switched our focus from creating makerspaces to creating makers. One piece of advice I would give is to not let the lack of space stop you from starting a makerspace. I know that sounds contrary, given that it is a makerSPACE, but it’s not. Embrace the idea of temporary spaces, moving spaces, rotating spaces—and it all will work out.” Here’s how one library used a temporary space for making, over a time span of three hours: time lapse video (1:13) of Meridian Library setup, programming, and take down in July 2013. “The biggest surprise in adding a makerspace to our library has been how it made us rethink our entire library and what we do…going beyond just a collection,” says Egbert. With the increased emphasis on STEAM skills, it is a natural step for libraries to expand their role in helping people learn valuable skills through makerspaces and other innovative programs. Libraries can provide the space, tools, encouragement, mentors, and support for people to create and make. Libraries are looking at their collections and space in new ways, reevaluating and re-envisioning ways to find dedicated space for the “Make It at the Library project” and keep their communities engaged in emerging trends. The “Make It at the Library” project is made possible in part by a grant from the U.S. Institute of Museum and Library Services and a grant from the Micron Foundation. See more on the Idaho Commission for Libraries website at http://libraries.idaho.gov/make-it-idaho and on their Facebook page at https://www.facebook.com/MakeItIdaho. Teresa Lipus, Public Information Specialist, Idaho Commission for Libraries (ICfL) with significant input from Erica Compton and Sue Walker, ICfL project coordinators. Functional Requirements for Bibliographic Records, or “FRBR,” has been a concept in incubation for some time. It is a general rather than specific type of metadata schema, which means it is not a system you can implement to provide record structure or content standards (Taylor & Joudrey, 2009, p. 104). Rather, it is a conceptual framework for bibliographic control, and focuses on relationships within and among items library personnel and other information professionals organize. FRBR also offers guidance to catalogers by outlining “user tasks,” or the expectations information seekers bring with them when engaging a catalog in search of information. Being aware of the following user needs: to “find,” “identify,” “select,” and “obtain,” provides catalogers direction when making decisions during record creation. This selected literature review offers a brief explanation of the need for FRBR before describing its essential elements, or “entities.” I’ll then discuss literature that serves to introduce LIS students, librarians and other information professionals to this conceptual model by exploring points of view regarding the changes FRBR brings. Why FRBR, or, in Other Words, Why Bother? While many readers likely remember card catalogs, few will remember (or at least have used in practice) book catalogs, a creation that marked the beginning of the modern era in bibliographic records. Svenonius (2000) describes the utility of the book catalog, noting some of its attractive features including hierarchical integration of various forms of a work, and its recognition for the need of nonhierarchical elements (secondary attributes) through cross-references (p. 62). She cites nineteenth century librarian Antonio Panizzi who revolutionized cataloging during his time, and believed that more references would make a catalog more useful (Svenonius, 2000, p. 63). Card catalogs heightened bibliographic standardization, and, like their predecessor, maintained a hierarchical structure that allowed users to find everything in a particular library by an author, and everything related to a work under the name of the work’s author. As Taylor (2007) describes, a work could have a group of cards taking up an inch or more in a card catalog drawer, but these cards would contain, altogether, information about and related to the work. This logical collocation of bibliographic information was lost with the advent of the online catalog. Most items in a library are cataloged at the manifestation level instead of the work level, and relationships between manifestations are often not noted. According to Svenonius (2000), online catalogs have “brought…a steady deterioration in the integrity of bibliographic structure” (p. 64). FRBR may be the answer to restoring this loss of structure and integrity. In 1998 the International Federation of Library Associations (IFLA) published its final report on what they termed Functional Requirements for Bibliographic Records, or “FRBR.” According to the IFLA, FRBR was developed, in part, to establish a “framework for relating the data that are recorded in bibliographic records to the needs of users” (IFLA, 2008, p. 7). It can be used, or adapted, to various data models, including MARC, although newer tools such as XML are easier to customize for use with FRBR (IFLA, 2012). FRBR is an entity-attribute-relationship model made up of three “groups” of entities for organizing information. An entity is a thing to be organized, an attribute is a characteristic, and a relationship is a connection. As Taylor (2007) explains, entities are first identified in a bibliographic system, attributes of the entities are identified next, and the relationships between entities are then specified (p. 4). Group 1 provides a logical hierarchy of what it is we are organizing. It is made up of “work,” “expression,” “manifestation,” and “item” categories. A “work,” a concept that has been thought and written about for some time in the information profession, is “a distinct intellectual or artistic creation” (IFLA, 1997, p. 13). An expression is the realization of a work, and it is important to note that these two categories do not represent something tangible; it is the manifestation category where the physical embodiment is represented in the record. The item is a single exemplary piece of a manifestation. To demonstrate, the popular story Gone with the Wind is a work. The expression could be the novel (as opposed to the movie, or a movie poster, for instance), the manifestation could be the 1936 first edition of the novel (as opposed to an e-book, or book on CD), and the item would be one particular copy of the first edition. Group 2 entities consist of “persons,” a “corporate body,” or the newly added “family” categories. These entities represent who is responsible for the intellectual or artistic content or the physical production of the item of interest in the first group. Regarding our Gone with the Wind example, the “person” category would be Margaret Mitchell, the novel’s author. If, however, we were referring to the DVD of Gone with the Wind, under the “corporate body” a cataloger would list Selznick International Pictures and Metro-Goldwyn-Mayer. Group 3 entities include “concepts,” “objects” “events” and “places,” or in other words, subjects of a work. Concepts are notional ideas, objects refer to physical objects, events describe occurrences, and places are locations. FRBR addresses user tasks through its entity-attribute-relationship model, described above. The User Tasks portion of FRBR acknowledges Charles Cutter’s cataloging rules first published in 1876. Cutter suggested that library catalogues (he was talking about dictionary catalogs at the time) should be able to allow a user to: find a book for which either the author, title, or subject is known; show what the library has by a certain author, subject, or type of literature; and to assist a customer with the choice of book regarding its edition or character (Cutter, as cited by Taylor, 2007). FRBR’s user tasks address the requirements Cutter suggested, and adds a fourth, “acquire or obtain access to the entity described” (Taylor, 2007, p. 15). We can find different points of view in the literature on FRBR articles written for or primarily for introduction purposes. The articles to some extent tell a similar story as they promote basic understanding and clarification, however, some authors acknowledge hesitation within the library profession towards the affects FRBR will have on current cataloging practices. The following themes are apparent in the FRBR literature revealing some of the perceived pros and cons of FRBR, and ways of approaching this new world of bibliographic control. 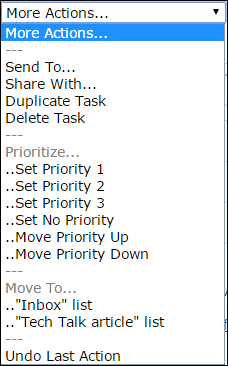 Where focus is on the basic functionality of FRBR entities, “user tasks” are also often introduced. Copeland (2010) explains that the whole purpose of FRBR is to address these tasks. He explains FRBR’s four user tasks (find, identify, select, and obtain) and, like Tillett (2003) and Adamich (2007), demonstrates how FRBR maps its entity-attribute-relationship model to specific user tasks. Although often described as something “new,” FRBR is the culmination of nearly 175 years of thinking of the purpose of catalogs and how they should serve their users (Denton, 2007, p. 35). Denton (2007) reminds us FRBR is not the “finish line” for organizing the bibliographic universe, but changes have come quickly, recently, and perhaps this is why explanations and reassurances are something of a common thread in FRBR articles. Bowen (2005) reassures those who might be experiencing “FRBRphobia” that FRBR “offers great potential for influencing the way that we think about bibliographic data” (p. 175). More than that, she points out that library catalogs already contain some of the elements of FRBR, and that rather than thinking of it as something “new,” we should think of it as a more robust way of doing what we already do (Bowen, 2005, p.186). This urging to not call FRBR “new” is reiterated by Le Boeuf (2005), who tells us FRBR, or at least parts of it, were discussed by cataloging theorists like Lubetzky, Ranganathan, and Heaney (p. 3-4). Tillett (2003), who authored some of the earlier articles on FRBR, describes FRBR as an “opportunity” to take another look at—and improve—our cataloging rules (p. 12). Adamich (2007) insists that school librarians have been doing this sort of “relationship organizing” for years. He points out past significant changes in the materials offered, as well as changes in cataloging presentation and procedures; changes that we have survived. Adamich assures readers that embracing FRBR will aid in virtual school library catalogs and collaboration. In spite of reassurances, and the historical momentum that brought us to this place in our understanding of bibliographic organization and user needs, anxiety-induced obstacles to embrace FRBR exist and are acknowledged in the literature. Copeland (2010) says that “the idea that seasoned catalogers may have to re-learn the fundamentals of library cataloging and that bibliographic control systems will require re-engineering is a daunting task” (p. 17). Although Copeland goes on to say, essentially, that the effort will be worth it, the general sentiment is echoed by others. Bowen (2005), for instance, points out a number of specific obstacles, including that although FRBR is organized starting at the “work” level and proceeding from there, cataloging is carried out in the reverse: starting at the manifestation or item-level. She assures readers, however, that most of the time, this approach to cataloging can still be carried out, and collocation at the expression level of a work rather than cataloging at the expression level will achieve the same benefits for the user. In addition, Bowen points out that rules for headings for expressions in AACR2 will need to be written, and system vendors will need to be convinced that a FRBR-based interface is what the public wants. This question, “Is this is what the public really wants?” is at the core of the user-centered movement that many in the library field have embraced, and perhaps at the core of some trepidation towards FRBR. Zhang and Salaba (2012) recently explore this question, writing on three studies where users conduct searches using FRBR. They acknowledge that while FRBR implementation has been “exploratory” due to system catalog designs and interpretation of cataloging rules, users of their developed FRBR prototype catalog preferred it over a traditional catalog by 85%. Moreover, they found that 100% of the participants in their study preferred the FRBR prototype catalog to a “regular” catalog when looking for a specific type of material or language (p. 718). In addition, 88% of participants responded positively to FRBR groupings (work, manifestation, and expression), and in general, participants felt “that the groupings were intuitive and made searching faster and easier” (p. 720). Perhaps Zhang and Salaba’s (2012) research will act to lessen feelings of anxiety, and encourage catalogers to embrace FRBR as Le Boeuf (2005) does, and who urges his readers to see it as, if nothing else, a “helpful tool” (p. 10). FRBR is not a new concept in the history of cataloging. At least as far back as the mid-nineteenth century, Sir Antonio Panizzi was writing about “works” (Denton, 2007), and in the late nineteenth century, Charles Cutter was developing user tasks as a guide for the purpose of the library catalog. By the mid twentieth century, several of FRBR’s entities were being written about by Lubetzky, who clarified the distinction between a “work” and a “book” (Svenonius, 2000, p. 16), and by Wilson (1968), who was writing about works, expressions, and manifestations, even if he was not using these exact terms explicitly (he does speak of a “work” extensively). Today, what is exciting about FRBR is the international cooperation in its development. When the International Federation of Library Associations (IFLA) met in Stockholm, Sweden in 1990 to discuss bibliographic control, it was resolved that a study get underway to define the functional requirements for bibliographic records. Seven years later in 1997, the study group’s report was approved, and has had considerable impact on the library community ever since (O’Neill, 2007). Today, development is ongoing. FRBR as it stands is not fully developed, but “a model that requires continuing refinement, interpretation, and development” (O’Neill, 2007, p. 61). Separate working groups for each of the FRBR group entities (1, 2 and 3) meet to further define and understand the functionality of the FRBR groups. As of 2007, over 500 studies, articles and papers have been written either directly or indirectly about some aspect of FRBR (O’Neill, 2007). The largest group of research articles are indexed under the heading of “Theoretical Aspects” which include general introductory materials (O’Neill, 2007, p. 64). I’ve highlighted a selection of introductory materials here, each offering valuable instruction and insight into a complex model for bibliographic control. This article is meant to set the new FRBR student on a path of discovery starting with some resources providing knowledge basics before further study into this chapter of bibliographic organization. 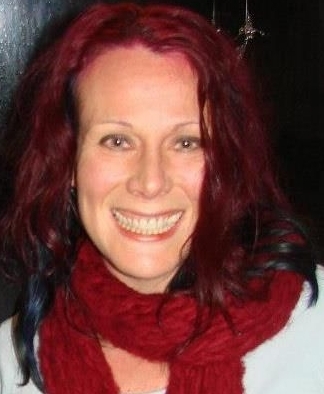 Tracie Kreighbaum, M.L.S., is a Ph.D. student and part-time instructor at the School of Library and Information Management, Emporia State University. She is a career public librarian, an advocate for equitable information access, and a cataloging enthusiast! Adamich, T. (2007). FRBR: Cataloging’s future is closer than you think! Knowledge Quest, 36(1), 64-69. Copeland, J. H. (2010). RDA and FRBR: A brave new world in cataloging. Arkansas Libraries, 67(2), 14-19. Denton, W. (2007). FRBR and the history of cataloging. In A. Taylor (Ed. ), Understanding FRBR: What it is and how it will affect our retrieval tools (pp. 35-57). Westport, CN: Libraries Unlimited. IFLA (1997). Functional requirements for bibliographic records: Final report. 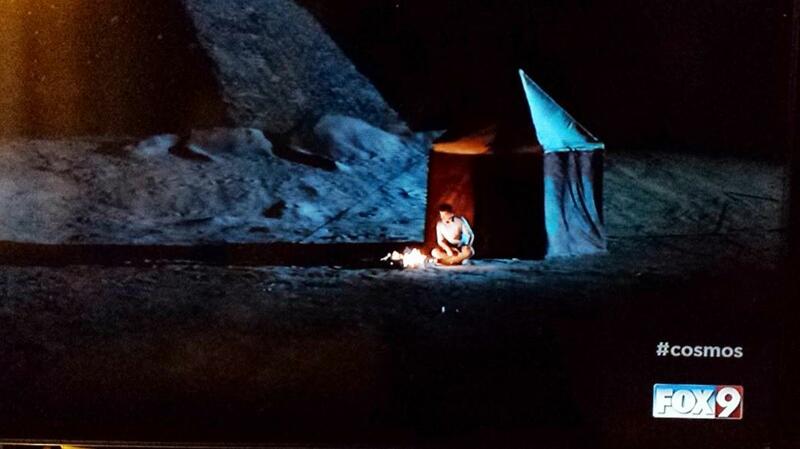 O’Neill, E. T. (2007). The impact of research on the development of FRBR. In A. Taylor (Ed. ), Understanding FRBR: What it is and how it will affect our retrieval tools (pp. 35-57). Westport, CN: Libraries Unlimited. Svenonius, E. (2000). The intellectual foundation of information organization. Cambridge, MA: MIT Press. Taylor, A.G. (2007). Understanding FRBR: What it is and how it will affect our retrieval tools. Westport CN: Libraries Unlimited. Taylor, A. G. & Joudrey, D. N. (2009). The organization of information (3rd Ed.). Westport, CN: Libraries Unlimited. Tillett, B. B. (2003). FRBR (Functional Requirements for Bibliographic Records). Technicalities, 23(5), 1-13. Wilson, P. (1968). Two kinds of power: An essay on bibliographic control. Berkeley and Los Angeles: University of California Press. Zhang, Y., & Salaba, A. (2012). What do users tell us about FRBR-based catalogs? Cataloging & Classification Quarterly, 50(5-7), 705-723. It is easy to become entrenched in how library services have always been done and keep telling people “sorry, we don’t have that.” However, building a dynamic library service requires actively listening for the things patrons keep asking for, seeking out opportunities for growth, and finding creative ways to say “Yes.” Instead of dismissing ideas due to existing constraints, the Meridian Library created a wish list of services and found ways to implement them using a mix of new technology, existing resources, and ingenuity. The Meridian library has long been a place that helped patrons complete job applications and other important paperwork by providing access to technology, loaning out USB drives, and offering printing services. However, we did not offer faxing or scanning services and often had to refer frustrated patrons to the nearest FedEx or UPS store. Though installing a dedicated fax line was too expensive, we still wanted to meet this demand and provide a one-stop service experience to patrons. Ultimately, the Meridian library decided to try offering faxing via online service as a cost-efficient alternative. We purchased space-saving Doxie scanners ($149), which made scanning easy once connected directly to the computer. Once scanned in, documents could be saved as PDFs and uploaded for faxing or e-mailing. We tried several online fax services. The first, FaxZero, was free but restricted faxes to three pages per fax and limited the daily number of faxes sent to five. FaxZero also required users to have an e-mail address and required them to access their e-mail after “sending” the fax to authorize the actual sending of the fax by clicking on a link. The number of steps involved in the process was difficult to explain to patrons and the page limit required us to say no to a large number of people. Since FaxZero did not adequately meet our needs, we switched to HelloFax and subscribed to a monthly plan (19.99$ per month for up to 500 pages sent). This allowed us to fax multiple pages easily and provided added options for signing documents and e-mailing scanned documents using the online service. HelloFax does not require the sender to have an e-mail address and allows information services staff to complete the entire faxing process at the desk. Documents sometimes take up to 15 minutes after sending to arrive, but confirmation of the sent fax can be conveniently e-mailed to the patron if desired. The option to print and copy in color has been another frequent request by patrons, and, as with faxing and scanning, we had to direct patrons to a FedEx or UPS store. Our main obstacles to offering color printing were the increased cost of the color cartridges and the lack of adequate equipment. When we replaced our old copy machine, we eliminated the technical constraint by purchasing a color copier with scanning capabilities (Konica Minolta bizhub C224e) that allows patrons to copy in either black and white or color. We set up our public computer stations with an option to print to the copier to receive color prints. Our IT staff was able to set the color printing and copying charge to 25 cents per page instead of the 10 cents charged for black and white copies using our existing SAM printing system. Many patrons rely on libraries for convenient online access and printer use. Unfortunately, at the Meridian Library at Cherry Lane, waiting periods for computers of up to an hour are common during afternoon peak times. Even at our Silverstone Branch, there are times of day when patrons have to sign up for the computer wait list. Having to wait is particularly frustrating for those who only need to print a coupon or check their e-mail for a minute. To better accommodate short-term computer needs, we converted an existing search computer into a 15-minute Express computer that cannot be reserved. The Express computer still requires a patron to log on, but the wait to complete a quick computer task is never frustratingly long. As this computer is stand-up, patrons rarely use the computer for extended periods of time, even though they could theoretically log on repeatedly. The Express computer has worked so well that we converted a second computer at our Cherry Lane location and installed an Express station at the Silverstone branch. Since we began offering e-book and e-audiobook check-outs via Overdrive, patrons have often asked library staff for help using their various electronic devices, or sought out input on which device to purchase. We have provided assistance on setting up and using electronic devices, and provided an assortment of devices patrons could preview at the library as part of a “technology petting zoo.” In an effort to allow patrons to take home electronic devices and try them out for a longer period of time, we began to experiment with checking out Leapsters and iPads to the public in May 2013. With the goal of combining access to technology with exposure to fun and educational early literacy resources, we pre-loaded the devices with a selection of early literacy apps. (For a full list of the apps loaded onto our devices, see Appendix A). Because the Leapsters had limited space, we split up the pre-loaded apps available on each device by topic—reading, math, science, and miscellaneous. While patrons were initially interested in the different Leapsters, demand dwindled within a few months to a few people who liked the devices and continued to come back for repeat check outs. Some patrons gave feedback that the Leapsters were prone to bugs and did not work reliably. Staff was also less excited about the Leapsters, since they are more work-intensive to recirculate. Since users are able to create multiple visitor accounts, the devices have to be reconfigured by IT staff each time they are returned. The iPads on the other hand have continued to be very popular, with about two thirds of the available devices checked out at the moment. The iPads require minimal maintenance: on check-in, we simply delete the browser history and delete any pictures. After re-charging, they are ready to be recirculated. I agree to accept full responsibility for the Electronic Device while it is checked out to me. The check out limit is one Electronic Device per household at any given time. The Library reserves the right to refuse service to anyone who abuses equipment or is repeatedly late in returning Electronic Devices or who places the Electronic Devices in the book drops. I agree that the Library may use any appropriate means to collect the amount owed for fees, damage, loss, or theft of the Electronic Device and that my record will be submitted to collections within 30 days. Those in the information professions are at the forefront of changes in technology and information access. They easily see the impact of the changes on society and work to continue serving patron needs regardless of format. There are, however, conflicting opinions as to whether there has been an explosion in information technology advances or whether there have been slow and steady technology advances that are only now impacting society. To decide which is correct, the librarian as information professional must be aware of the technology progression and how they must work to meet patron needs in a changing technological society. Understanding the history and attitudes involved leads to a greater perception of the arguments. Whether arguing for or against rapid information technology, their advances and resulting impact on society are backed by the histories of libraries and librarians. The records also detail the attitudes of librarians on a variety of changes, present and future, to library technology. Grossman chronicled the history of several librarians and changes to libraries from 1895-1940. To those who experienced it, the Progressive Era, 1895-1920, was a time of rapid changes through movable type and future scientific and moral progress (Grossman, 2011, p. 108). One Italian librarian, Guido Biogi, saw the future post-1904 as a place of worldwide interlibrary loans sharing information with even the poorest country and making books available to all through sound recording (Grossman, 2011, p. 107). His global interlibrary loan plans were well received; however, the technology of books as sound recordings was viewed as a threat to print material and a “radical speculation” (Grossman, 2011, p. 107). The Depression Era libraries looked forward to further changes in technology (Grossman, 2011, p. 109). These still early days of electronic technology were on the edge of a great unknown, a world increasingly open to information sharing and storage. Ranganathan, author of the five laws of library science, believed in 1931 that libraries would change in ways he could not even conceive, where “a day may come when the dissemination of knowledge [will be] by means other than the printed book” (Kwanya, Stilwell, & Underwood, 2010, p. 2). Avery Craven, in 1932, saw libraries of the future economizing, planning nationally, and regularly using technology through microfilm for document preservation and television for interlibrary loans (Grossman, 2011, p. 112). R.H. Carruthers, 1937, Sidney B. Mitchell, 1938, and Robert Bingham Downs, 1948, all saw microfilm as crucial to the future as libraries shared collections and stored information (Grossman, 2011, pp. 115, 120-121). Ethel M. Fair, 1936, predicted technology would help librarians better serve individuals and society, rapidly turning over the collection, (Grossman, 2011, p. 120) while her contemporary, Robert C. Binkley saw microfilm as a way to “lead the whole population toward participation in a new cultural design” (Grossman, 2011, p. 121). Overwhelmingly, these librarians advocated the sharing and preservation of information through current and future technologies. The gradual move from accepting microfilm and sound recordings to using computer technology in libraries was definitely shaky. The 1943 chairman of IBM, Thomas Watson, said, “I think there is a world market for maybe 5 computers” (Schwirlich, 2010, p. 22). Library advocate Jesse Shera met with similar computer biases from librarians in 1956 and 1964. Shera was promoting the computer as a way for libraries to deal with an increasing amount of information but was frustrated by librarian “fear of and resistance to the new machines” (Grossman, 2011, p. 124). Ken Olson, founder of Digital Equipment Company (DEC) said in 1977, “There is no reason anyone would want a computer in their home” (Schwirlich, 2010, p. 22). This mixed reaction to the future use of computers was a roller coaster ride for libraries until the 1990s and the advent of the World Wide Web. The subsequent “rapid adoption of the Internet throughout society” (Grossman, 2011, p. 124) and the need for libraries to work with the advances in information technology could no longer be denied. Regardless of pessimists such as Bob Metcalfe, who said in 1995, “I predict the internet will soon go spectacularly supernova and in 1996 catastrophically collapse” (Schwirlich, 2010, p. 22), the Internet remains in existence with applications expanding throughout the world’s societies. Kwanya, Stilwell, and Underwood argue that, while libraries have always been in a state of change, “…current societal change is so fast that traditional library change management mechanisms cannot cope effectively with it” (2010, p. 2). The rapid change view is supported by UK studies of Internet use: in 1998, nine percent of UK households had home Internet access; in 2003, it was forty-nine percent; and by the end of 2006, it was sixty-seven percent (Morris, 2007, para. 4). This is a remarkable increase of technology use throughout a majority of society. Those without Internet are largely those cultures affected by age (over 65 years old), low income, and lower level of education (Morris, para. 7-8). In Victoria, Australia, with under 55% at adequate adult literacy, household Internet connections went from 32% in 1998 to 78% in 2008 (Schwirtlich, 2010, p. 23). Certainly this is an indicator of a rapid acceptance and use of information technology. Technological changes have quickly affected the way members of society communicate. The widely adopted ability to communicate electronically with technology has moved countless years of face-to-face interaction and many thousands of years of written correspondence into a back seat. They have been replaced with the online interactions of social networking, Internet communications, and networked information and knowledge (Miller & Wallis, 2011, p. 122). Online communication using the Internet is different than traditional methods. According to Edwards and D’Arcy, online interaction necessitates “the ability to seek out and use others as resources for action and equally to be able to respond to the need for support from others” (Miller & Wallis, 2011, p. 123) on a technological level. This is also expressed as “knowing how to know whom” (Miller & Wallis, 2011, p. 123), working and communicating collaboratively through the Internet regardless of borders. This comes as no surprise to traditional college-age students, 18 to 24 years old. These digital natives have grown up without knowing a time different from our technological information age. To them, the use of online sites and Web 2.0 applications for education, social contacts, and working with the library is second-nature (Cassidy et al., 2011, p. 381). A study done by Cassidy, Britsch, Griffin, Manolovitz, Shen, & Turney did find digital natives using social applications for peer interactions more often than traditional methods. Education and learning applications were used only as needed for a class or when students found them convenient for multi-tasking, such as PodCasts, e-books/readers (2011, p. 382), and reference chat (2011, p. 389). The changes in communication created by technology have been fully embraced by society with users eager for the next application development. Librarians have differing opinions on the rate of technological changes and its influence on society. Such dissimilar attitudes may have actually affected the librarians’ perception of whether information technology advanced and impacted society rapidly or not. Those who have been open to changes have seen a pattern in the progression of technological advances. Steady developments in information technology have a rapid impact when more people are affected. On the other hand, they may see the information technology changes without looking at and understanding the impact that has been made on society; these people will believe that the changes have been slow, steady, of little import, and will refuse to apply them in their own information areas. This writer finds little support for the arguments of the latter group. The changes from clay tablets to typewriters spanned many thousands of years; the changes from fountain pens to i-Pads, from using pencil and paper to creating correspondence through a computer application, has happened in less than a generation. While computers and information technology took some years to be adopted by general society, they were rapidly accepted and fully embraced when academic, household, and especially social applications were available. No one can truly predict the future of information technology and libraries. What librarians can do is understand society and societal influences, be aware of advances and declines in information and technology, and be open to support the patrons (Schwirtlich, 2010, p. 22) when they adopt a new technology. The implications of technology’s impact on society relate directly to librarianship. The advice of Jesse Shera in 1933 still applies, “the all-important fact to be remembered is that the library is distinctly a social phenomenon and as such is susceptible to all the influences that react upon our social structure” (Grossman, 2011, p. 125). In a time of fast results through technology, society is increasingly used to getting what they want, when they want it. They expect no less from the library and its staff. As a result, and regardless of cost, libraries are expected to make their resources quickly accessible online, across many platforms, interactive, and easily located and researched (Schwirtlich, 2010, p. 23). To meet all of these expectations, librarians must be creative and dedicated to the end service product of fulfilling patron needs. In Victoria, Australia, libraries are working with the government to improve network access and benefit the community as the library becomes ‘borderless’. It will exist on the Internet with librarian information brokers and on location as a place for community innovation and information sharing (Schwirtlich, 2010, p. 24-25). These libraries are working within Ranganathan’s five laws: 1. Books are for use; 2. Every book its reader; 3. Every reader his book; 4. Save the time of the reader; 5. A library is a growing organism (Kwanya, Stilwell, & Underwood, 2010, p. 4). While the term ‘books’ has become exclusionary in an age of technology, libraries are able continue Ranganathan’s laws by interpreting for changes in technology and working to continue the library’s growth in all areas. Librarians must meet patrons’ skill needs by developing programs that help patrons become more comfortable, effective, and successful through technology literacy. Bridging the digital divide, or the Internet and electronic technology information gap, is increasingly necessary for the vast population’s success. In current society, “information and knowledge is power” (Morris, 2007, para. 11) and those without Internet access and skills are becoming the “information poor” (Morris, 2007, para. 11). Since the library and its access to information exists everywhere, without physical barriers, it is also the library’s responsibility to create disintermediation, patron empowerment to serve themselves (Kwanya, Stilwell, & Underwood, 2010, p. 12) through training and technology access regardless of the patron’s setting. In a time when technology links the globe’s information and knowledge in the blink of an eye, the information poor must be active and able information technology participants to also be societal participants. As has long been a library mission, programs must be created to improve patron information access, regardless of format and regardless of the speed of technological changes. To better develop and maintain the programs, librarians must regularly attend training, whether it is on how to teach patrons, how to use technological applications to develop resources, or how to be an content advisor (Pegrum & Kiel, 2011, pp. 583-584). They must also be interested in emergent technology including those developments that may or may not become popular with society. An awareness of what is being developed, how it would apply to information, reading, and research, and a basic knowledge of what it entails in cost and training is part of being a professional librarian. This involves Kirkpatrick and Kirkpatrick’s categories of learning – knowledge, skill, and attitudes (Pegrum & Kiel, 2011, p. 587). The librarian’s attitude must understand and be empathetic to the challenges faced by patrons working with technology (Miller & Wallis, 2011, p. 124) if both parties are to advance. Libraries, librarianship, depth of knowledge, and diversity of skills continue to change; librarian attitudes toward technology must change, also, or libraries and society will suffer. & Underwood, 2010, p. 13). By recognizing that the future will bring changes that impact all areas of the library and society, librarians as information professionals will be in place to be successful. Cassidy, E.D., Britsch, J., Griffin, G., Manolovitz, T., Shen, L., & Turney, L. (2011, Summer). Higher education and emerging technologies: student usage, preferences, and lessons for library services. Reference & User Services Quarterly, 50(4), 380-391. Grossman, H.B. (2011). Comparison of the Progressive Era and the Depression Years: societal influences on prediction of the future of the library, 1895-1940. Libraries & the Cultural Record, 46(1), 105-128. Kwanya, T., Stilwell, C., & Underwood, P.G. (2010). Library 2.0 principles and Ranganathan’s fifth law. Mousaion, 28(2), 1-16. Miller, F., & Wallis, J. (2011, Spring). Social interaction and the role of empathy in information and knowledge management: a literature review. Journal of Education for Library & Information Science, 52(2), 122-132. Morris, A. (2007). E-literacy and the grey digital divide: a review with recommendations. Journal of Information Literacy, 1(3), 13-28. Pegrum, M., & Kiel, R. (2011, November). Changing the way we talk: developing librarians’ competence in emerging technologies through a structured program. College & Research Libraries, 72(6), 583-598. Schwirlich, A. (2010, March). Public libraries and change: a perspective from Victoria. Australasian Public Libraries and Information Services, 23(1), 22-27.